On the morning of November 8th, 2018 life in Butte County changed. Paradise, Magalia, and Concow California is home to over 35,000 residents. In the early morning a small 200-acre fire started in a remote area of the county. With winds gusting more than 60-70 mph, the fire soon forced its way to the populated area on the eastern side of the city of Paradise. By 10 am, Paradise became a chaotic scene as thousands of families and business were forced to flee. By 6pm the fire had consumed over 90% of the communities of Paradise and Magalia, leaving thousands homeless and with nothing. This has been a whirlwind of emotions for our community and our Scouting families. Our Scouting community has been rocked by this deadly and destructive fire. So much so that close to 300 scouting families were displaced, and over 90% lost everything in this fire. Six of the eight Scouting units lost their place of meeting and all their scouting equipment. Our local Scouting leaders came together and immediately started efforts in not only helping our Scouting families, but our community. Within 48 hours we converted the NorCal Scout Shop in Chico into a relief center, donation and distribution center of needs that were being donated to help those that have been affected. Within the first few days we had hundreds of local Scouts and leaders step up to the call. Many of our scouters helped at over 8 different evacuation centers with estimated over 10,000 combined hours of service at these locations alone, and these numbers increase daily. Many helped at the Scout Office with collection, separation, and distribution of various items, ranging from clothing, to food, to toiletries and much more. We have collected over 25,000 food items, from can goods to non-perishables. Within five days the need for space became an issue. We received support from local businesses and even businesses from out the area who stepped up to the call. We received donated warehouse space in Chico where we have been able to receive, sort, and organize thousands of items that were donated for this effort and turned this into a distribution hub where our dedicated volunteers have worked to assure that these goods are distributed to where they are needed most. We have been receiving support and donations from community members and Scouting units from across the north state, region and even country. There have been food and donation drive’s in Redding, Galt, Sacramento, San Francisco Bay area and much more. Within the first week we have had support efforts and drives being conducted not only in our Council, but from Councils all across the Boy Scouts of America. There has also been drives to help our Scout unit’s re-coup what they have lost. From uniforms, patches, awards, Scouting equipment, etc. We want to personally thank all our Scouting families from across the country who have answered this call for service. We have been receiving support, love and encouragement from Scouting families as far east as New Jersey and Florida, Washington State, Oregon, California, Nevada, Hawaii and more. With the love and support that we have been receiving, we know that our Scouting Units and their families will be taken care of and our communities will again be as beautiful as it once was. We want to personally thank all of those who have generously offered housing for those affected. Those who are conducting drives to get new Scouting gear. Those who are helping with assuring that our Scouts and leaders look like Scouts, with purchases and sponsorships of uniforms and awards. We feel truly blessed to have such a strong Scouting support. From the start we knew that this was going to be a long process. As Scouts we strive to live our lives daily by the Scout Oath, Law and Promise, to continuously be ever mindful of others. This is not a sprint, this is a marathon. Our mission in the Ranchero West District is to be here to continue that call for service. When items are needed. We will be here. When our families return home and need help in clean up, we will be here. When our communities start to rebuild, we will be here. Our mission is not over, it has just barely begun. From all of us here in the Ranchero West District, we thank you for your dedication, service, devotion, and love. Your unit can help promote Scouting by helping at Sportsmen's Expo. Help is needed to run Scouting activities at the Youth Fair. If your unit is interested in helping, please visit the GEC website or contact Chas Murphy. Youth Fair activities include: Climbing Wall, BB guns, Pinewood derby track, Robotics and STEM activities, Laporte Archery, Scavenger Hunt, Life-size Jenga. University of Scouting is an excellent training opportunity for Scout leaders and Scouts throughout the Golden Empire Council. UOS is the only place where you will find such a wide variety of training opportunities. Whether you're new to the program or a veteran of many years, UOS provides valuable courses, leadership training, and elective courses applicable across the Scouting programs. New this year - Youth Merit Badge Classes. This year we will be offering a selections of Merit badge classes. Your Scout can work on Merit badges while you become a trained leader. Scouting for Food is a nationwide Boy Scouts of America community service project in which Scouts canvas their local communities collecting food for their local food pantries. All Units, Scouts, leaders parents, siblings, family members, and friends in the golden Empire Council are invited to Help! Scouts obtain satisfaction and demonstrate how they may serve others by providing a valuable and needed service to the less fortunate in their communities. The Scouting for Food website for the Golden Empire Council has been updated with all of the tools needed for the 2019 Scouting for Food campaign. 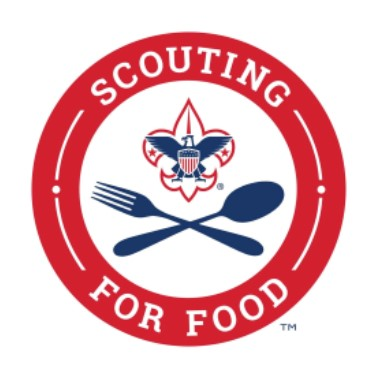 Please click the link below to find information to share with your unit for our March Scouting for Food event. Every Scout deserves a trained leaders. Trained leaders help make the Scouting programs the best they can be. Scouts who have the best programs are more engaged and more likely to stay in Scouting. Have you started the online training for your leadership position but have not finished yet? Changes are coming soon to the online training programs. Anyone who has not completed the current training by January 1st will need to start over when the new training is released. Complete your training now. Most people don’t volunteer because they’ve never been asked. For Jen Theisen, an invitation from the Scoutmaster of her son’s troop to volunteer moved her from the back of the room to the one helping lead the adventure. Watch her story. A simple invitation ignited a life-long love of adventure and Scouting. Who are the three people you can invite to help lead the adventure? Since its founding in 1910, the Boy Scouts of America has included fully participating members with physical, mental, and emotional disabilities. Youth with disabilities want to be, and can be, treated and respected like every other Scout in their unit. 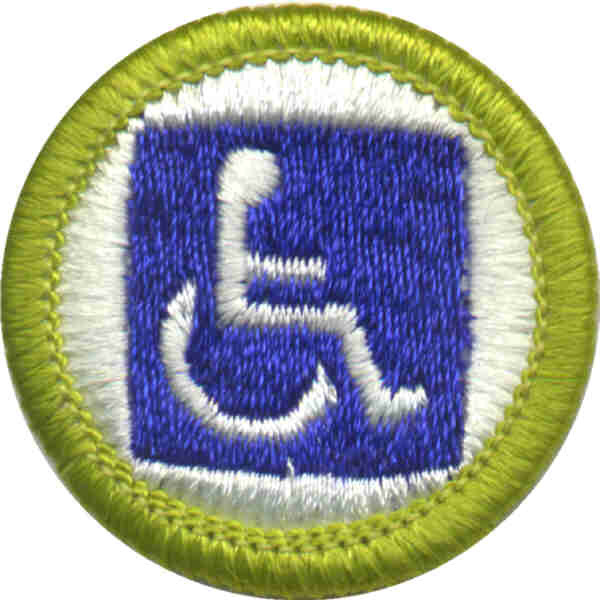 Though it is possible to form a troop consisting solely of Scouts with disabilities, experience has shown that scouting is most successful for Scouts, with and without disabilities, when every Scout is fully included in regular patrols and The Troop. 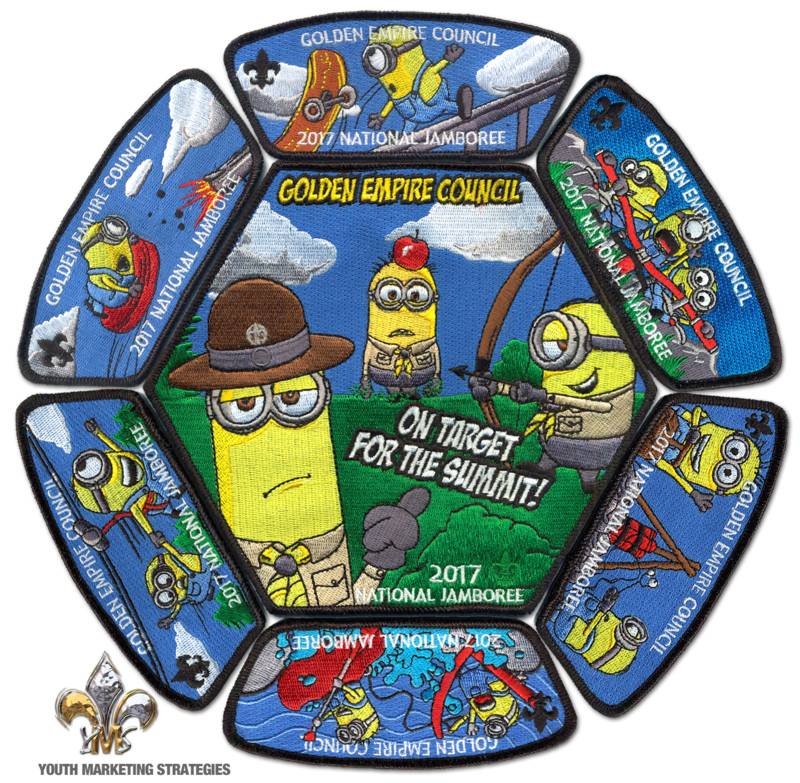 This is where the newly-formed Golden Empire Council Committee for Accessibility can be beneficial as a resource to help a Scout and unit navigate the unique challenges and opportunities that they may encounter. 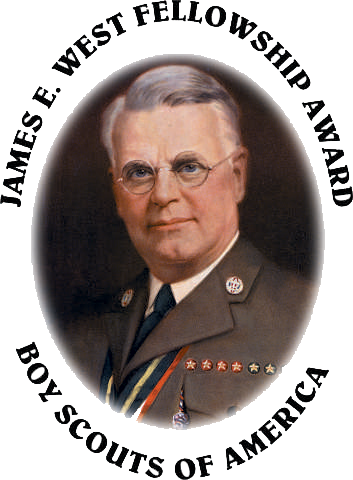 Our mission is in line with the BSA mission to "...prepare every eligible youth in America to become a responsible, partcipating citizen and leader who is guided by the Scout Oath and Law." Some of the new girls’ Troops will get their start and may even share resources with an existing Scouts BSA Troop of boys. We’re calling that a ‘LINKED TROOP’, and we’re hopeful that resource sharing idea will help many of the new Troops of girls get off to a great start. But, at the same time, we expect your existing Troops of boys to continue to offer a great program. Please let us know if can help? Speak with your unit’s Commissioner and/or District Executive and schedule a meeting with you Chartered Partner to discuss ‘Family Scouting’ and the idea of a ‘Linked’ Scouts BSA Troop of girls. Sign up for our inaugural year newsletter aimed at helping those involved in forming and operating Scouts BSA Troops of girls (Click here). ‘Packs’ & prospective ‘BSA Troops of girls’ should contact their District Executive to complete the set up requirements. (staff directory). Once set up, the www.BeAScout.org unit pin will indicate that the Pack has dens for boys and girls. 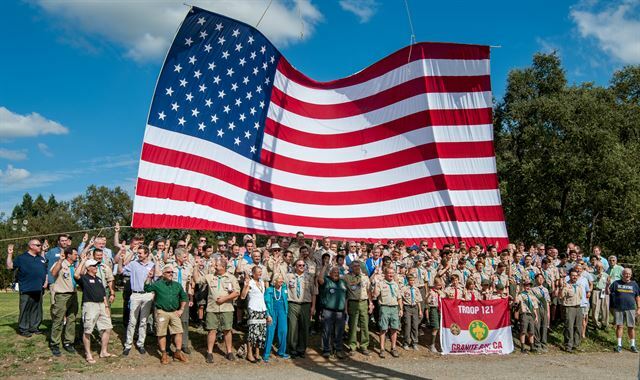 In September, Troop 121 celebrated 50 years of service to the Granite Bay Community and 300 Eagle Scouts. Over 300 people attended the celebrations which also included the presentation of Eagle ranks, scholarships, and a special remembrance video of long time Scoutmaster John Hooten who passed way this past year. Congratulations to Troop 121. May they continue for another 50 years creating many more Scouting experiences and many more Eagles. The Golden Empire Camps are ready for the 2018 season! Camp sessions have just begun but to continue our camp improvement plans, we are already looking towards 2019. 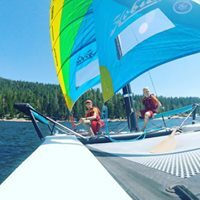 Don’t miss out on your chance for the experience of a lifetime at Camp Lassen or Camp Winton for summer 2019 by signing your Unit up NOW! You will also have an opportunity to sign up during your stay at camp over the 2018 summer, but we didn’t want you to miss out on your chance to attend in 2019. WE WILL SELL OUT – so get your reservations in early! Contact the Camping Department with any questions at Camping@GEC-BSA.org or at 916-333-5434. 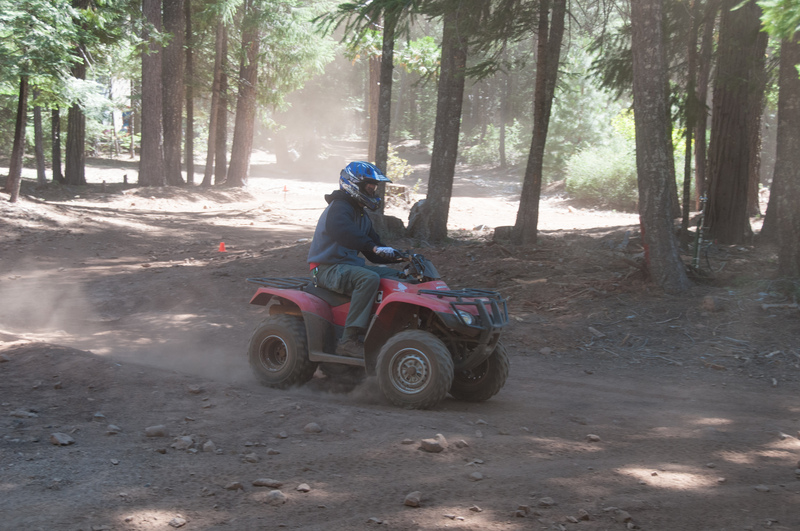 We look forward to seeing you over the next two months at Camp Lassen and Camp Winton. We are “scouting” for our 2019 National Youth Leadership Youth Trainers/Mentors! Did you enjoy your National Youth Leadership experience? Make a difference and become a youth mentor/trainer who is willing to share their knowledge, personal experiences and excitement about what learning and then practicing servant leadership skills looks like. It can make a huge difference in the life of a youth member for their troop and/or crew and their life. Interviews will be held January 19th 2019 from 2:30 PM - 4:30 PM at 1101 51st Street in Sacramento at the Church of Jesus Christ of Latter-day Saints. Please go to our NYLT page for more staff information, to download an application and to sign-up for an interview time! We look forward to meeting you! Calling ALL NYLT Staffers, past and present, Alumni and current staffers, young and old and older! We are excited to announce our first ever Council NYLT Staff Potluck and Game night and we want to see you there! Mark your calendars for January 19th 2019 from 5:00-9:30 PM for a night of laughter, shenanigans, camaraderie, food and fun! E-mail Claralyn Sant at c2sant@gmail.com to RSVP with your name, phone number, the years you served as well as the SPL and CD’s you served under and positions you held! Please bring board, card, and/or team building games of your choice! It won’t be the same without you so plan early to attend! 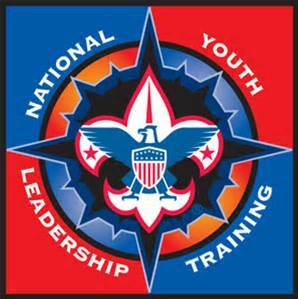 National Youth Leadership Training Registration! There is more than holidays coming in December! National Youth Leadership Training registration opens too! Sign up on our on our National Youth Leadership Training page for instant notification when the registration link drops so you can register early before all the slots fill! Think about giving the gift of leadership to your youth; there’s not another program in the US like National Youth Leadership Training! Find more info on our NYLT page! 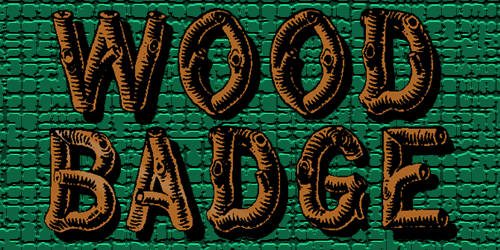 Wood Badge is a council-run, six-day advanced leadership training for all adult Scout leaders. On course, you will learn valuable leadership skills, you can apply not only in Scouting, but in other community organizations, at work or in business, and in your family or personal life. Wood Badge is the very best adult leader training that the council offers, and mot importantly, Wood Badge helps units succeed! Registration for the lottery for 2020 treks are now being accepted. In December, the Lottery determines trek date assignments. We strongly recommend that units register for the lottery to have the best chance of receiving their desired trek date, and to have adequate time to prepare for their trek. 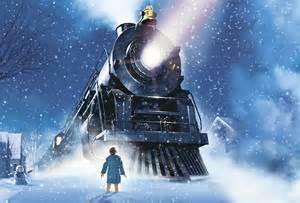 Volunteers Needed – Help with THE POLAR EXPRESS™ Train Ride this Holiday Season! The California State Railroad Museum Foundation is seeking 18-year-old Venture Scouts or 16-years-old and over Scouts to volunteer for the popular annual THE POLAR EXPRESS™ Train Ride in Old Sacramento. THE POLAR EXPRESS™ Train Ride runs Wednesdays-Sundays, November 23-December 20, with departures each operating day at 3:30pm, 5:00pm, 6:30pm and 8:00pm. Each day, THE POLAR EXPRESS™ requires about 100 volunteers. 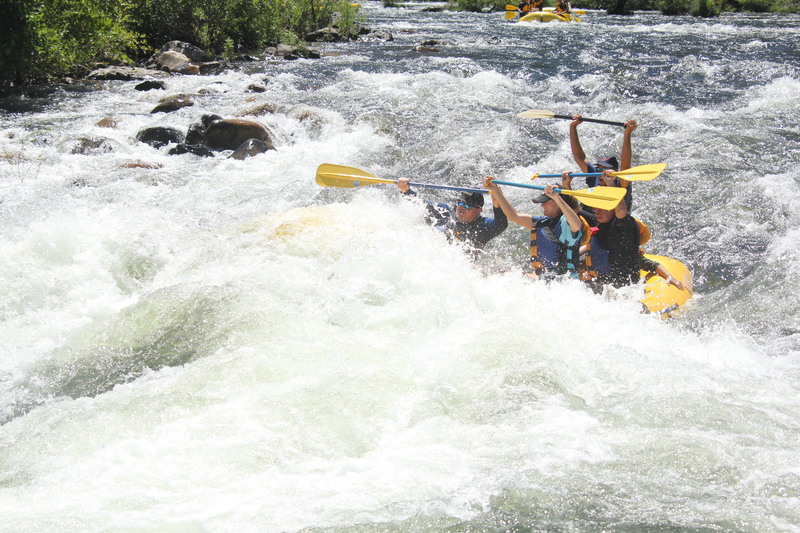 River Runners has been providing high quality whitewater rafting adventures on the American Rivers near Coloma, California since 1974. Over the years their trained Merit Badge Counsellors have awarded countless Scouts with both the Whitewater Merit Badge and Kayaking Merit Badge. The Golden Empire Council and River Runners are now creating a partnership to teach more scouts how to navigate whitewater. 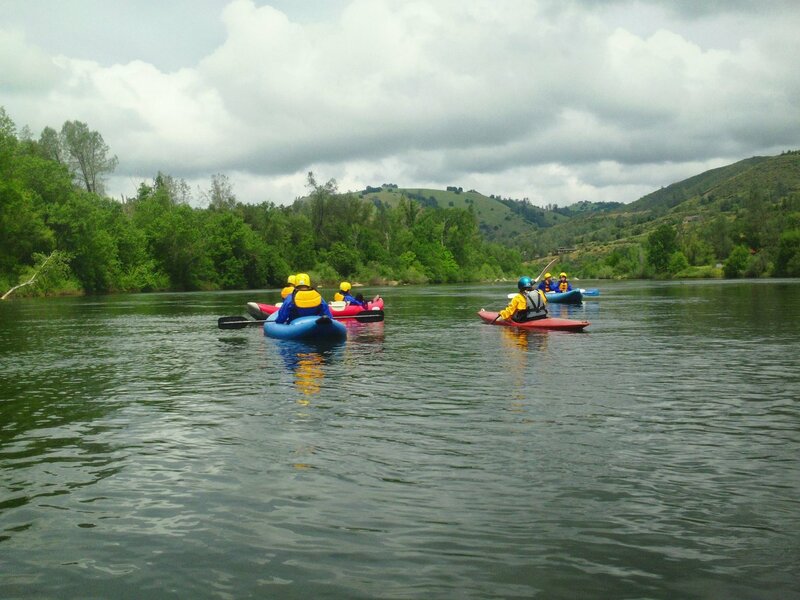 From March through September River Runners offers adventures and whitewater merit badge courses that keep your Scouts feeling challenged and connected with nature in a meaningful way. There is always plenty of time for Scouts to just play and experience the simple joy of being on the river too. With hassle free catered camping and high-quality meals it’s also a treat for scout leaders and chaperones. At a recent Council Connections meeting which is a quarterly meeting that all district leadership and council committee leadership attend to keep our Council on track for GOLD, our volunteers developed the 2019 Golden Empire Council Calendar. 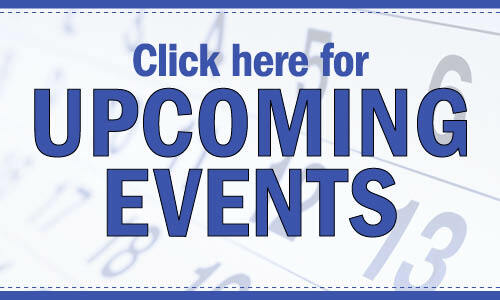 We hope you plan to attend many of these exciting activities and use it to plan your unit activities. Dinner to recognize the work of our volunteers to provide Scouting programs. Silver Beaver recipients honored. Golden Empire Council – BSA was recently recognized for our transparency with a 2018 Gold Seal on our GuideStar Nonprofit Profile! GuideStar is the world’s largest source of information on nonprofit organizations. More than 8 million visitors per year and a network of 200+ partners use GuideStar data to grow support for nonprofits. In order to get the 2018 Gold Seal, GEC-BSA shared important information with the public using our profile on www.guidestar.org.